Umbrella Art Ideas for preschoolers through second grade. Draw a picture of an umbrella, make copies enough for each child. Cut out umbrella’s, have child paste on to a 9×12 blue construction paper. Have child brush on spots of glue around the umbrella and give the child some white rice to glue on for rain. 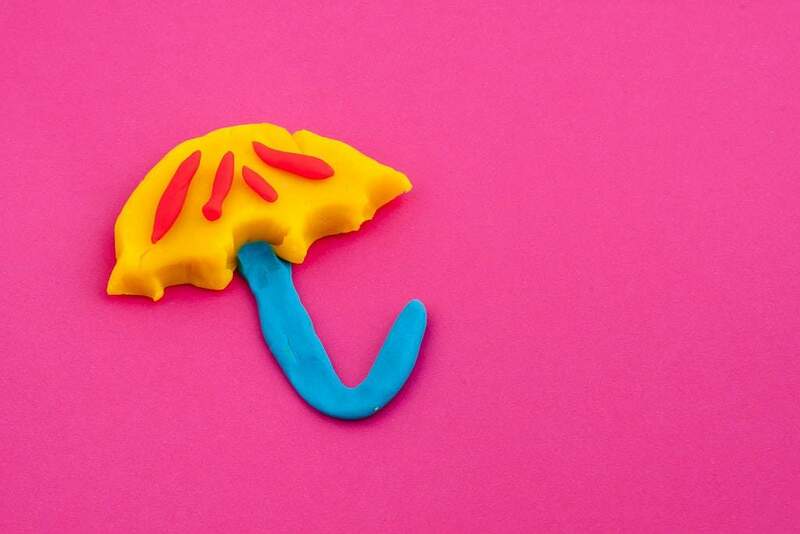 Cut out the letter “U” out of sponges and have children sponge paint letter “U” inside the umbrella. I had my toddlers make umbrellas by cutting a large paper plate in half and using bingo dobbers then stapling a precut handle on it. I hung them in my window and had them make thumb prints with blue paint for raindrops. Cut out a large umbrella from paper. Water down tempera paint so it has more of a thinner consistency. Take plastic water droppers and use the droppers to fill up with tempura. Then let the children use the eyedroppers to “rain” on the umbrellas. I cut out umbrella shapes and let the kids glue on buttons and scrap material cut into squares. We then added a pipe cleaner for the handle and it had to be the cutest and most simple project I have done for my rain themed week! Making an umbrella. Take a paper towel and cut it into an umbrella shape. Then have the children paint by using water colors. ( food coloring and water works great for water colors) Then have a precut handle for the bottom of the umbrella and glue it on after the top dries.